The Green Mountain Stage Race (GMSR), traditionally held on Labor Day Weekend, is always a bittersweet time of the year. On the one hand, GMSR is one of the very best events in the region country, on the other hand, it signals the end of yet another road season. For some people, that means brushing off the knobby tires and diving head first into cyclocross season, while for others it means taking some time to rest before ramping up training in preparation for next season. Regardless, GMSR never fails to be a fun and challenging capstone to the road season. The event features four stages - an opening 5.7 mile mass-start legal (i.e. no TT bikes) time trial, a circuit race (this year due to emergency road construction, the “circuit race” was relocated to Killington), the “queen stage” with a finish up Appalachian Gap, and finally the Burlington Criterium in the heart of downtown Burlington. This year, B2C2/JRA Cycles sent five riders to the race - Erin Faccone (W1/2/3), Lane Marder (W3/4/5), Michael Martin (M3), Tyler Parnes (M4), and Colin Reuter (M3). For some riders it was their first stage race, while others were returning to GMSR in hopes of redemption. As always, the challenging parcours and top-notch fields tested our limits, but the team was able to come away with some top 10 finishes, a win*, a win (! ), and plenty of lessons learned to be even more prepared for next year’s event. Traditionally, I haven't dedicated nearly enough time to perfecting the art of time trialing. However, given my power curve, I should be decent at it. Given good fitness, my small stature and the mass-start legal rules, I was optimistic that the Warren Store ITT would net me a decent result. I was so focused that I even bought an aero helmet and borrowed teammate Colin’s carbon wheels. I was able to nail my power goal up the opening climb and even managed to pass my 30s (hi Colin) and 1 minute men before the crest of the climb. Once coming over the top, however, I was greeted with a stiff headwind. Given the wind I didn’t feel comfortable riding in the invisible aero bar position and instead chose to stay in the drops. I kept my power up across the downhill portion of the course, but failed to keep enough of a match in the reserves for the final kicker. Once the results sheet was posted, I found myself disappointed with my result (35/67, 1:31 back from 1st) but also motivated to get redemption on the remaining days. The upside to time trial day is that you only spend less than 20 minutes racing and therefore as with every year, post-TT celebrations were had at the Warren Store in the form of sandwiches and snacks with friends. Bike racing is very, very hard, but at the end of the day, the incredible community is what keeps us coming back each year. In a stage race I find it easiest to take things one day at a time. I was really looking forward to the uphill time trial on day one, especially after discovering I wasn’t terrible at time trialing earlier this year at KSR. Plus I have such fond memories of the Warren General Store from previous gap riding adventures, where I usually stumble in totally cracked after summiting multiple gaps and craving sugar in the form of their homemade berry crumb bars. The time trial itself didn’t go quite as smoothly as planned. I rolled up to the SRAM tent five minutes before my scheduled start since my bike was giving me trouble throughout warm-up after swapping out the cassette and chain a couple nights before for my climbing setup. The mechanics were incredibly helpful, but after taking a closer look told me that the barrel adjuster was so far out they couldn’t fix my shifting with the limit screws and would need more time to work on it after my race. Through grinding gears, skipping sprockets and a gusty headwind at the top of the hill I climbed my best, but missed out on the podium by less than two seconds that first day. GMSR is the only road racing event (as opposed to criteriums) that I do each year, and it never ceases to amaze me how hard cat 3’s can pedal in a straight line. I came into the TT with a goal of “set a power record so you feel confident about cyclocross season” and I met that goal. Not bad, right? I’ve been racing bikes for 11 years now and that was the most powerful 18 minutes I’ve ever done. Unfortunately, I still only beat 4 people (out of 67!) and got roasted by Mikey (ON A DOWNHILL!) so that didn’t bode well for the next three days…. For me, GMSR is a sort of marker of time. The end of road season for many, it serves as the final piece of the cyclocross base puzzle for me. Last year was my first time here and got punished by both the difficulty of the course and my own inexperience. My preparation was different coming into this year’s race, and I had higher hopes for my own performance. A ~17 minute uphill time trial offers an excellent opportunity for power testing, so I decided to go data free and pace for what I thought would be my best 17 minutes (what could go wrong?!). Naturally I sprinted out of the gate and up the first 30 seconds of the climb before settling in. Roughly 4 minutes in I started to taste pennies in my mouth, the ultimate indicator of hard VO2 efforts, and recognized that I was going to pay dearly for going out so hard. My one-minute person passed me before the top of the climb (WUT) so I pretty much resigned mentally to a nearly DFL experience for the second year in a row. I did my best to keep pedaling and keep her in sight, but the false flat section after the climb was basically a wind tunnel and she cut through it way faster. Imagine my surprise when I finished the effort and discovered I was actually not last, but 13th! Only 1:38 down from the winner, who turned out to be the one-minute person who roasted me on the climb! Personal victory! Being my second-year (but first “real” year) racing bikes, and first year with B2C2, I was really excited to take on my second stage race of the year (first being KSR earlier in the year). My training coming into GMSR was derailed for a solid two weeks, following a crash at a local crit – cyclists like to make excuses, right? I knew I was going to struggle with the first three days, but was eager to really race the crit on the fourth day. For me, GMSR would ultimately turn into a learning experience. Lining up at TT, I was feeling optimistic – with my weight and power numbers – and, I was feeling pretty confident with an uphill TT. I went out hard and set three new peak heart rate numbers. At the top of the first punchy climb, I dropped down into my fake aerobar position, but with the high winds it felt super sketchy, so I settled for the drops. Unfortunately, my efforts were not rewarded with a good time. I was cautiously optimistic heading into this stage. 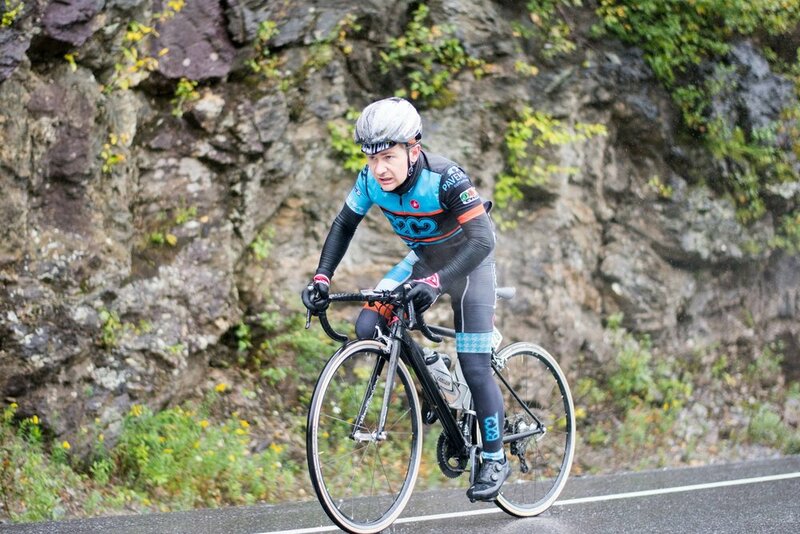 I knew (most) of the roads from Killington Stage Race (KSR) and despite the fact that I botched the finish magnificently at KSR, I was still confident that a slightly uphill sprint at the end of a long road race with a decent amount of climbing suited my strengths well. Well...my optimism was shattered about two miles from the start as the KOM jersey hopefuls hammered up the first climb. Thankfully, the first KOM was followed by miles of downhill on which to recover. We hit the biggest climb on the course, Rt 24, and the pace started ratcheting up again. The field was strung out coming over the KOM, but thankfully it all came back together throughout the feed zone. As we approached the final KOM and the dirt section of the source, I moved up as I was confident in the fact that if a break was going to get away it would be on this section. As anticipated, attacks started to fly literally as soon as we hit the dirt (thanks to Cam Clayton of GLV). After taking some chances on the descent, a group of about 10, including the eventual GC winner, had separation over the group. Unfortunately there was too much yelling and not enough pedaling and the rest of the field eventually caught back on (hi Colin!). After things cooled down a bit, we started the jockey for position leading into the finish. I ended up on the far left of the pack in the final km. Rob Montgomery of 1K2GO jumped first on the left. I hesitate as I felt it was a bit early and wanted to wait for the rest of the pack to surge. No one jumped and eventually I decided it was time to go and I opened up my sprint with a few others on the left hand side. I spent the last 250m waiting for the “real sprinters” to come around me, but they never did, and I was able to take 4th, just off the podium. This result far exceeded my expectations and was enough to make the whole weekend feel like a success. Seemingly every day leading up to GMSR they posted a new course for the circuit race. I was pretty happy when, finally, they settled on basically the same course as the road race at KSR, minus the finishing climb. I knew what I had to do. The first surge happened after five miles at the first QOM climb. I barely made the selection of front riders over the top, and it hurt, a lot. I was hoping I hadn’t warmed up properly; otherwise it was going to be a long day in the saddle! When I’d been here before for KSR I felt like the new girl (without a team) and nobody knew who I was. But the really fun part of coming back for GMSR was that by then riders in the field knew who I was, and I knew some of them! For the easy miles along 100 I chatted in the back of the group with Emma, who had raced with me at KSR. As I made my way to the front of the group approaching the second climb, other riders called out until I got to the front and the race leader says, “Hey girl! I was wondering when I’d see you!” It felt really good. I stayed near the front the rest of the day leading the field up some of the climbs, marking Monica in the yellow jersey, trying to stay out of the wind on Route 4, and most importantly making sure there weren’t any moves that went without me. The group was still together as we approached the finish. The winning attack came from the right side, as one of the girls flew up the shoulder before cresting the hill. On the opposite side of the road I held the race leader’s wheel and rolled in for a seventh place finish. Mission accomplished. This year’s circuit race had way more climbing than last year’s, which seemed fair since we *are* at the Green Mountain Stage Race and all. Literally one mile into the race we started climbing for the first KOM, and I got to set my second power record in as many days! Awesome! At the top of the climb I was totally crosseyed and on the verge of getting dropped, but at least my Garmin agreed that the reason I was dying was because I was trying INSANELY HARD. I spent the next hour trying to recover into to see straight and achieved this just in time to fly up the next big climb and have another near-dropped experience over the top. But once again I survived! On the third and final dirt climb I did slightly better and might have even kept half the field behind me over the top -- but with the dirt descent shredding the field, this ended up being the hardest I had to chase all day. When I made contact with the front group it was only 25 or 30 guys, much to my excitement! Sadly it was 25 or 30 guys who didn’t really want to pedal hard since all the strong guys were in the group, so all the guys we had dropped on the dirt section eventually rejoined and all my eye-crossed stem-eating was for naught. At the end of the race, my body helpfully pointed out that my training had been entirely 90 minute rides by cramping up on the final roller (2:15 into the race), so I rolled in for a glorious 23rd place. Mikey got 4th, though, so the stage was a huge success that I obviously had a lot to do with. Last year’s GMSR was one of my best results of the year, so imagine my excitement for a sprint stage with another year of fitness! But wait, we’re actually doing the KSR road race course instead? My inability to read course profiles told me that this finish was still for the sprinters, so I deluded myself into excitement for the race. Praise be to whichever kind soul warned me of the ~2 mile side-splitter of a climb that starts 2 miles into the race. The Canadian national team sent a full squad to the race, so I suspected we wouldn’t be casual about the pace. I did a thorough warm-up, knowing there would only be a few minutes before we started climbing. Thank goodness for that because the Canadians attacked from the start of the climb and I did my best 5 minutes of the WHOLE YEAR coming detached from the front group up that thing. I was really excited for stage two, and get some redemption here from my TT. Having done most of this route earlier in the year at KSR, I knew how important a good warm-up was going to be. I waited until about 5 minutes to go before rolling to the line, and lined up towards the back of the field. This would be mistake number one. About two miles into the race, we were met with a steep climb and the first KOM. I lost contact with the group about halfway up. Luckily, I was able to get two other riders to work with me, and over the next several miles we caught back on. As we hit the second major climb I fell off the back again, never getting back onto the main group. Shockingly, hours of neurotically refreshing the weather forecast on Saturday night, did not prevent the remnants of Hurricane Harvey from making their way to Vermont. Thankfully, Carlo Quicho’s mid-week anxiety about the weather forecast had motivated me to pack more warm clothing than I normally would for this race. The house debated for quite literally, hours, over what to wear and ultimately I settled on the tried and true method of “literally everything.” Thankfully, I had remembered to pack my pair of (still mud stained from Cyclocross Nationals) Castelli neoprene gloves, which are absolutely invaluable in conditions like this. The initial downhill miles were, to be honest, completely miserable. However, I had faith that once we started climbing body heat would make the conditions more bearable. I managed to make the selection over Middlebury Gap, however, because this is the Cat 3 race at GMSR, the field came back together after the descent. Some apathy on my part resulted in me hitting Baby Gap at the back of the back. I immediately realized my blunder and moved up, but it was too late, and a group of ~20 already had separation. I chased up and across Baby Gap with another rider and just caught the tail end of the lead group on the bottom of Appalachian Gap. I put my head down, hammered Appalachian Gap with everything I had, and came away with 16th. I don’t think anyone in our house slept much Saturday night; we were all too terrified about the weather and descending Middlebury Gap in the pouring rain. The next morning I pulled on all the layers I packed, even food service gloves (thanks, Erin!) under my normal gloves. As a climber, I was targeting Sunday’s stage, but as the forecast took a turn for the worse I worried that it would simply come down to who wore the right layers, didn’t get a mechanical and was able to eat enough during the race. As we rolled out for the neutral start I took my favorite spot in the pack: off the back with Emma. I was gapped before we even turned onto 100. In most cases, racing in the back of the pack isn’t recommended, and I’ve paid for it plenty of times by missing breaks or getting tangled up in crashes. But knowing that nothing much would happen before Middlebury, I was happy to have some space as the rain poured down on us. As I rounded one of the sweeping S-bends on 100, I saw a massive pile up ahead of me on the road. Unfortunately it was a really nasty crash that had taken out nearly a third of the field. Luckily I was safe. When we hit Middlebury Gap I moved to the front and set the pace. More keen on having an open road for the descent than picking up QOM points, I was one of the first few riders over the top. Descending Middlebury in the rain wasn’t nearly as scary as my dreams the night before, and surprisingly I wasn’t the most terrified rider out there. Through punchy QOM climbs and a soggy dirt road I held on, trying to take in nutrition whenever I could. The lead group dwindled throughout the day. Fumbling with double layer gloves I dropped my Clif bar out on the dirt road before taking a bite. Somewhere around the dirt road our race leader dropped out too, finally succumbing to the cold and rain. By Baby Gap we were down to eight. 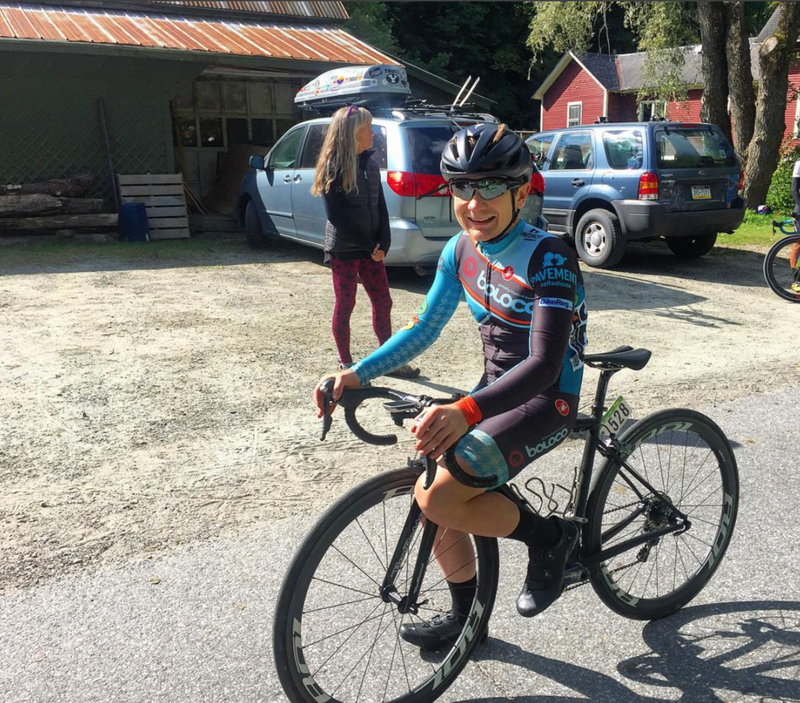 Knowing that Emma would go for the QOM points on Baby Gap, as she had for every other climb over the past couple days, I decided to go with her to test the legs before Appalachian Gap and make sure I was near the front in case a move went sooner. I followed Emma and Shaina over the top of Baby Gap and the three of us had put some time into the rest of the group, enough time. I was ready to push each other home up App Gap. Still trying to eat whenever possible I pulled out my final Untapped Maple to power me through the finishing climb. While struggling to open it, the road pitched upward yet again. With the syrup in my right hand I shifted with my left into the little ring… and dropped the chain. Total rookie move. I hopped off the bike, pulled the chain back on and rotated the pedals a few times, as the five racers we’d gapped on Baby caught up. Thankfully able to continue, I chased ahead and all eight of us came back together for the finishing climb. At the base of App Gap I went for it, leaving the other seven riders behind before I knew it. About halfway up the climb I saw a flash of orange over my shoulder. Shaina had bridged to me. She mentioned something about being envious of my 32t cassette, then continued on right past me. The rain was blowing sideways in sheets while I climbed trailing Shaina for another mile or so, convinced I would finish second on the day. But then the road pitched up to the steepest gradients, near 20%, over the final kilometer. And to my amazement I started reeling Shaina back in! Still spinning away in the 32, I passed Shaina with the finish in sight and went on to win by 8 seconds. I had also ridden into first place in GC by 30 seconds. Instead of a podium ceremony, I spent the next hour huddling for warmth under wool blankets and sharing candy bars with the other women I had raced with while trying to figure out how the heck we were going to get down the mountain. The win felt very surreal. We knew it was going to be brutal. I wore all the clothes I brought to the start. It started raining during the neutral start and didn’t stop for basically the next 12 hours. I got dropped on Middlebury Gap (again), and then dropped by the grupetto on Baby Gap when I ran out of food and realized that any additional matches I spent on App Gap would be matches I couldn’t burn in the crit the next day. 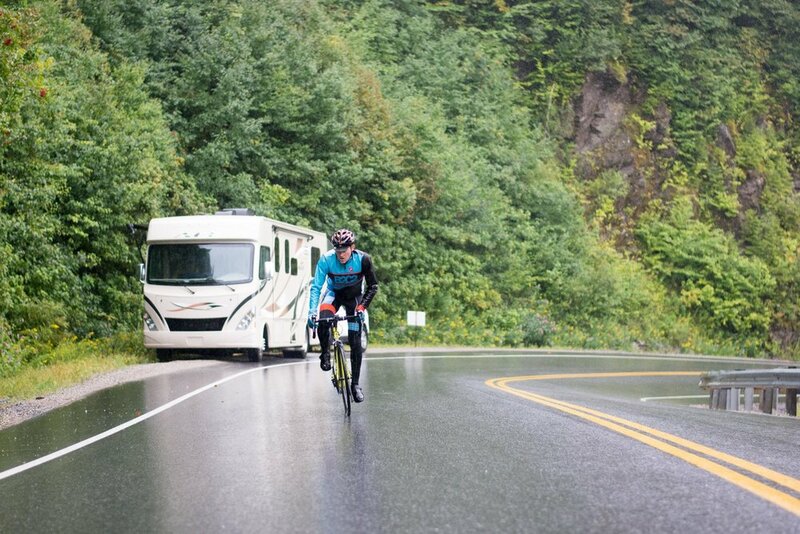 Riding the final climb at tempo allowed me to enjoy the absurdity of the experience, riding up a closed road, without a single other rider in sight, in steady rain (occasionally sideways rain), with a body that was slowly shutting down as it had run out of glycogen long ago and was deep into its longest ride of the season. But I finished, and it was surprisingly awesome. Stage three was the long road race that finished on top of Appalachian Gap. I didn’t have high hopes after the previous race, but having done the climb before, I was looking forward to a beautiful Vermont route. In the morning, we woke up to 50 degrees and hard rain. Leaving my two winter cycling jackets and thermal long sleeve kit at home, I threw on my vest and hoped for the best. About 30 minutes into the start I could feel my body shutting down, and was unable to stop shaking. I knew my race was over. GMSR has not seen the last of me though. If anything, I have more motivation than ever for next year. Even though my race was a huge disappointment, I got to hang out with amazing people, in a place I love. This is one of my favorite crits of the year and I knew that between Colin Reuter and myself we had a decent chance of snagging a result. After hanging out in the pack for a few laps, I found myself in an early move with Ken Greim (GLV) and two other riders. It was early, but we were a strong group and I thought we might have a shot. Unfortunately we got brought back and that move had taken quite a few of my matches. Sometime inside of 10-laps to go, Ken and Carlo went off the front. Not wanting my two break away buddy’s to get away from me, I tried to bridge, but inadvertently dragged the field up to them. Sorry guys. After the final prime at five laps to go, a small move got away while I was recovering from chasing Ken and Carlo. I found Colin, checked in to make sure he felt strong enough to sprint and immediately got to the front to start chasing. I got within spitting distance of the group before my matches ran out. I hoped however, that I had brought it close enough that the last lap sprint surge would swallow them up. Ultimately, Colin got a bit swarmed in the sprint, but it was a solid team effort and I was able to hold on for a pack finish, including holding on to my 4 second GC advantage over Carlo to snag the final GC upgrade point for 15th. In hindsight, there are some things I wish I had done different tactically and I fell short of my goal of top 10 on GC, but this was by far my best GMSR yet, despite the challenging conditions. This race is always a special way to end the season and I know that I will certainly be back next year. Burlington was my first crit, ever. “Just ride in the pack,” they said. “You’ll be fine,” they said. Easier said than done, especially when I bungled the sixth turn every single time. The announcer’s commentary didn’t help my case, pointing out that I was probably working harder than any other rider in the field while dangling off the back. I held on, burning matches up the hill on every lap, until I was finally popped with three laps to go. The final time gap to the field was only 24 seconds, but I lost the race lead with GC time bonuses in play. I ended up third step on the GC podium with only six seconds separating the three of us. I probably should have been more upset than I was about losing the yellow jersey that day, but it was an awesome weekend of racing to close out a successful road campaign. Plus I’m already getting excited for next season with the B2C2 ladies! After 3 days of getting sand kicked in my face by guys that could pedal, it was time for some revenge. The crit course is amazing, and difficult, with 6 turns and a climb all in 1k. I started at the front and never left, while trying to figure out how to repeat my field sprint win from last year. I felt like this year’s race was faster, and everyone had apparently watched my video from 2016 and discovered the hot line in turn 6, so I never felt as in control as I did last year. A late break got away and Mikey threw his chances of getting a result away to try to bring it back for me (no pressure). We hit the last lap with the break still holding 5 seconds on the field or so, but the field was FLYING with multiple solo bridging efforts firing off and gaps opening everywhere. I ultimately gambled on the wrong wheel (never trust a guy riding the last lap on the hoods!) and ended up on a wrong side of a gap with one turn to go, way back in 8th, as the field was just catching the break. Regardless of my own mediocre-or-worse results in most stages, GMSR is one of my favorite long weekends of the year, and I’m already trying to figure out how to not get dropped on Middlebury Gap next year (but I probably will). For the past two years, I’ve been too injured (see 2016) or too scared of the fast ladies (see 2017) to actually register for the best race in New England,* but have gone up to support, laugh at, and cook food for my teammates (and non-teammates) who stay in the big ol’ Vermont house that has become a traditional spot for B2C2 and family. This house holds the secret of bike racing. The secret of bike racing is not watts per kilo or regimented post-race protein shakes (Hi Carlo) or expert chop-and-drop tactics (Hi Kenny). The secret of bike racing is the too-weird-to-be-real friendships forged over long weekends in cramped houses. As amateur bike racers, the magic of bike racing happens off the race course. The magic is roasting mammoth marshmallows on a fork over a gas stove to make post-race s'mores, 500 calories each. The magic is hearing Kenny, Carlo, and Mikey record yet another absurd podcast where they parody every racer in New England, despite being the actual goofiest crew around (shout out to the entire scrubzone, all of whom are on my team, sponsor of the pod). The magic is post-race watt sizing, epic storytelling, and battling for who gets to used the space legs next. And the magic is, for sure, that avocado chocolate pudding Christin made that definitely could have financed my mortgage (recipe here). Even if not racing, the opportunity to hang out with the bike racing family is too good to miss. Though I have to admit, despite my soon-to-be husband and other teammates nearly dying on Stage 3 this year, the FOMO may have been real enough to make next year the year I tackle the second best race in New England.